An English veterinarian reminisces about his life, career, and animal patients in a small village. If you need an antidote to the depressing postmodern inanities we are forced to read in college, read Herriot. If you're tired of literary pretension and pomposity, read Herriot. If you're looking for humor and a warm humanity set against a backdrop of wild, breathtaking natural beauty — well, you really ought to read Herriot. 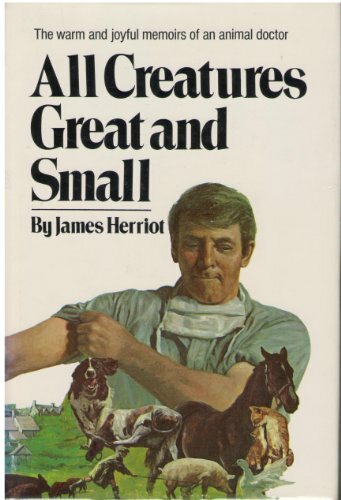 In All Creatures Great and Small, the first in his autobiographical series, James Herriot tells of his experiences as a veterinary surgeon in 1930s Yorkshire, England. It's a treasure of a book, the kind you buy extra copies of to give away, the kind you return to like an old friend. Herriot is one of the most likeable narrators I've ever had the pleasure of reading. He is very humble and aware of his own shortcomings, but instead of burdening the reader with self-absorbed, angsty self-esteem issues and blaming his environment and/or social context for whatever failings he possesses, he pokes fun at himself and gets us laughing too... while still sympathizing keenly with his triumphs and defeats. Other critics have noted that it's simply astonishing that an unknown vet would have such perfect literary control in his first book, but he does. It almost seems effortless. But this is no cozy, insipid, chicken-soup "inspirational" read. People who like such books may enjoy it, but there are harsh realities here too. Some stories don't have happy endings. Animals die. People die. Herriot witnesses the range of human relationships, from the millionaire whose wife and daughter despise him to the struggling farmer whose daughter bicycles two miles in the rain just to surprise her father with a bottle of Guinness. A lifetime of labor may come to nothing in the end; a man's dreams can fall through at the smallest misfortune. Farming in Yorkshire in the 1930s was about survival, a lifelong struggle with the elements. Herriot admires the toughness and plain courage of the average Dalesman while acknowledging the price such a life exacts. This isn't a book of warm fuzzies; it's much more real than that. At the same time, Herriot's wry humor is infectious and many of his observations get me laughing out loud, even on my third or fourth read. Siegfried Farnon and his colorful brother Tristan are masterpieces of character sketching; they could walk off the page. They were no doubt infuriating at times to live with, but such fun to read about. From Tristan's practical jokes and escapades to Siegfried's well-known "saintly" expression and tussles with Miss Harbottle, life with the Farnon brothers is always an adventure. And don't forget the crusty Dales farmers and other local characters, too many to count, or the many animals whose personalities color the stories. As the book is largely composed of anecdotes from Herriot's early years as a vet, there is an episodic feel to the narrative. But there are also some themes and broad arcs that come to a neat close by the end of the book, like Herriot's growing appreciation of the Dales farmers and his courtship and marriage with Helen (his descriptions of her, by the way, are lyrical in their simplicity and amazingly romantic; you can tell he loves her deeply and faithfully). Interspersed among all the stories are little asides about the practice of veterinary medicine, the old remedies the vets used and the revolutionary discoveries that were about to crash in on the practice and change it forever. I love the historical flavor, imparted by one who was there to see the old give way to the new. if you love animals and is curious about the life of a vet working with all creatures great and small, this is the book to read. Funny and heartwarming. Absolutely charming and immensely readable. Not much I can say that hasn't been said before... a timeless classic that I've reread a number of times. I enjoy each reading as much as the first, laughing and tearing up over the familiar stories and characters. All Creatures Great and Small is the memoir of an English country vet fresh out of university. From a cow having trouble birthing a calf to treating an over pampered pooch and everything in between, these are the stories of James Herriot's first years as a vet in the 1930s. This is an old favorite of mine: I'm not sure how many times I've read this delightful book since I acquired my first copy, about 1974, but every time I head back into the Yorkshire Dales, I am enthralled yet again. All Creatures Great and Small was written by a veterinarian, and is based upon his experiences in the Yorkshire Dales during the 1930s. The author had a way with words and situations that can make me grin and chuckle, or shake my head, or even, at times, can give me a lump in my throat and a tear in my eye! I am not an animal person by any stretch. I would much rather read about them than be around them. That probably has something to do with my copious allergies. I have been familiar with Mr. Herriot's books for a number of years, but haven't really read them much. When we started watching the BBC series on Netflix, I decided it was time to do it. The book is wonderful! I love his lilting style of storytelling. He has a way of describing some of the most uncomfortable things in the world, like putting his arm up the backside of a cow in the middle of a windswept field in the middle the night in January, that still makes it fascinating. While I could never be a large animal vet (or small animal for that matter), it have to say for a few short moments, I wish I could have his experiences. One side effect of reading his books is that I have a deep desire to see the Yorkshire Dales someday. His descriptions make it sound like a wonderful place with a wide variety of life to experience. The beauty he describes is captivating and sounds like some of those places that don't exist anymore. Who knows, maybe it doesn't really exist, but I'd like to find out. Very cute!! Some of James stories will have you either laughing out loud or almost crying. As well as talking about the many characters james runs into out in the hills of england, also talks about his personal life and the lives of his co-workers. This a good book to curl up with your own furry friend on the couch. Brings back memories of lazy summer afternoons as a kid, curled up with a good book. What a great book, full of humour, warmth and wisdom. I don't understand why I love these books. I have nothing in common with a English vet from the 1930's, but I enter Herriot's world effortlessly and laugh and cry with every story. What a writer. James Herriot is an incredible storyteller. His stories are moving, hilarious, and a pure joy to read. Humane and humorous memoirs about the life of a veterinarian, mostly set in the late 1930s through the 1940s with a few of the stories taking place in the 1960s in the later part of the series. The author drew upon a journal that he kept during those years. I have always loved animals, so this series was a natural one for me to pick up. The book can be read as though it were full of short stories, but reads even better as a complete story. James Herriot shares his success, failure, and humor in this beautifully written book. Herriot's first book, an autobiographical collection of stories recalling his life as a large-animal vet, is charming. He went on to write several more books on the same theme, and while some of them were more thematically unified, All Creatures Great and Small bounces around a little, and I think it benefits from the lighter touch. I'd forgotten how entertaining these stories are until someone gave me this for Xmas. Although I'd seen many of the classic TV series with Christopher Timothy, Robert Hardy and Peter Davison and read odd extracts I'd never read this edition in its entirety. Well worth reading even if you've seen the TV programmes or film. If you like people and/or animals, this book is definitely for you. This is the first of five books, none of which require any prior knowledge beyond the fact that the writer is a veterinarian in Yorkshire during the '30s and '40s. The author/narrator is plainly not a trained writer, but his writing is charming and engaging nonetheless, and he's got a distinctive voice and gift for sketching the personalities around him. The book is laid out in short story format, with one encapsulated story for each chapter or two, so it's an easy read to pick up and put down in those moments you have free. I first read All Creatures Great and Small when I was about 11 or 12 years old, and it sparked my great junior high desire to become a veterinarian. After over 30 years, I decided to re-read James Herriot's classic tale of being a veterinarian in 1930's Yorkshire countryside. Although I wasn't nearly as entranced as I was at 11, I enjoyed the book for what it is. If you love animals you will love these books. Additionally, these books can be read and put down easily since each chapter is generally a individual story . This makes it quite nice for brief periods of reading. It's hard to say how moving and motivating this book is - how to pursue living a life at its sweetest.